This will probably sound a little mean, but the first word that comes to mind on this flavor is non-offensive. Ok, ok, let me explain, because it's actually a compliment. While most cake flavors are trying to smother your taste buds with sweetness or artificial flavor, this one isn't doing either. 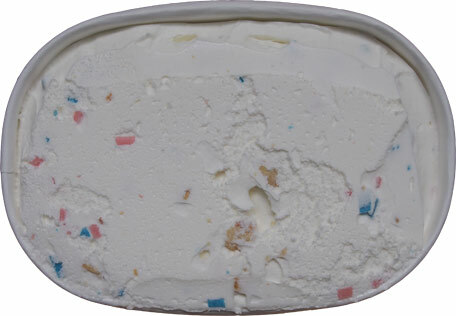 It's got a nice mild base, tons of soft cake pieces, and a nice unique take on sprinkles. Instead of real sprinkles, whether the hard or soft kind, they've gone with these somewhat soft rectangles that are kind of like colored white chocolate (not so much in flavor but in consistency). It's a neat touch that works well. Sometimes we look for texture changes to bring a pint to life, but other times I really like when a flavor doesn't try to take you out of the mood by jarring you with different textures. I've got soft ice cream, soft cake bits, and soft "thuds" (sprinkles) all coming together for a mild flavored, easy scooping ice cream. It takes the spirit of cake and does a nice, mild flavored tribute to it. On Second Scoop: I realized why I like this one more and more with every scooping. The base seemed familiar and then it hit me, it reminds me of vanilla soft serve! It's just got a nice flavor pop that works really well with the plentiful cake bites. Nice job Target. Good review. This is the only ice cream that me (normally lemon sorbet lover), my son (vanilla), and my wife (chocolate) can all agree on. It's delicious. We buy 2-3 at a time lol. I really enjoyed it too. I've been making the rounds on birthday cake flavors since I have three kids under age five. Right now I've got Turkey Hill party cake in my freezer to try. 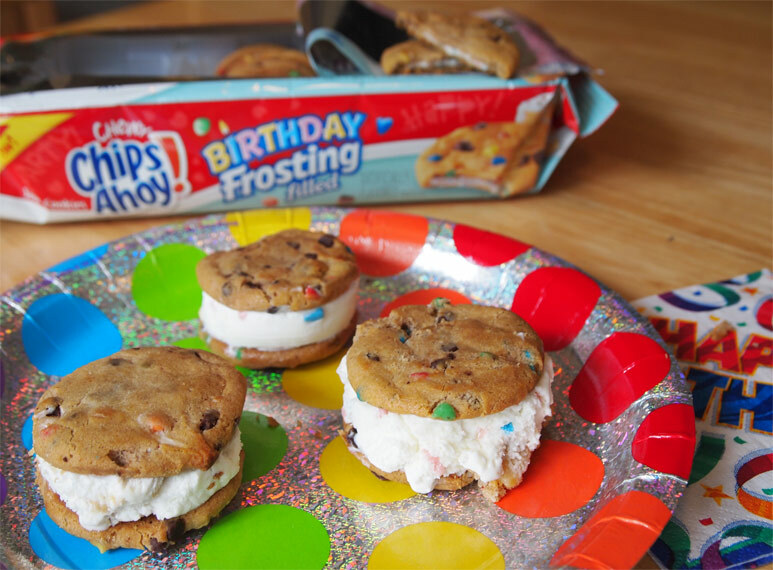 Loved your cookie sandwiches too! I need to try that. Generally these market pantry flavors are generics of other brands flavors. In this case, I think it's Kemps, which is a brand based in the midwest, like Target. 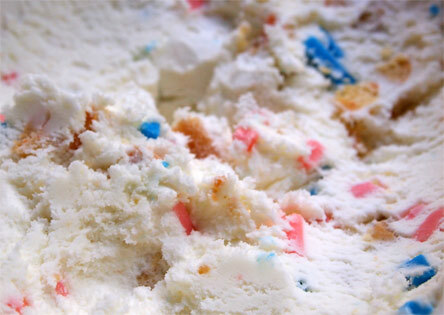 Kemps also made a Pillsbury-branded version of the Birthday Cake ice cream, with the same pink and blue pieces, the appearance of which, for reasons passing understanding, reminds me of "Big League Chew" bubble gum. The personal-sized cup of this was a favorite snack of mine on many summer days when my running path took me by the local grocery store. This sounds great but my favorite as far as cake flavors go is still is Perry's piece of cake. Not sure if they still make it and I didn't find a review for it on your sight. Give it a try if you haven't, I love it! @Anne: cookies and ice cream is always a win. 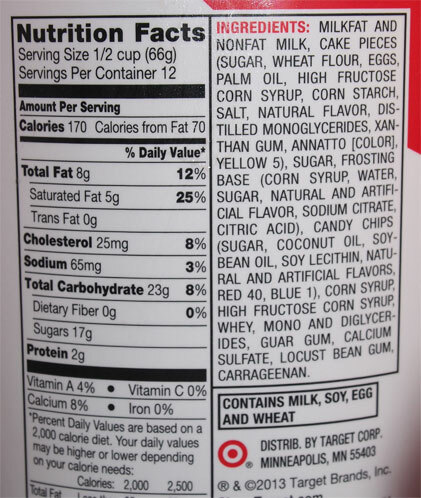 @Josh: HAHAHAHA, well, guess where Target ice cream is made? HINT: you already guessed it. @Sarah: I know of it, and they still make it, but I'm not sure I've seen it my Wegmans. Sarah, I've seen piece of cake at the Co-Op I toured. Looks like I'll have to grab it next time I'm there for a proper review! 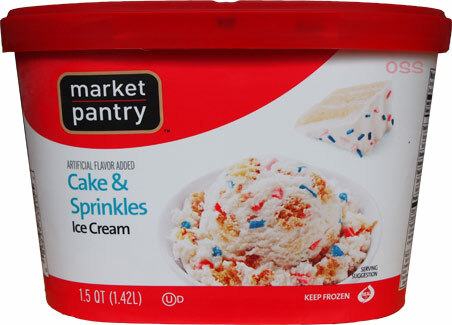 I love cake but have yet to find a good ice cream with cake pieces. This one is absolutely awesome in my opinion. Great quality. Best yet. Can we start a campaign to bring it back?